Harald Katzmair is the founder and director at FASresearch, a Social Network Analytics & Strategies firm located in Vienna and Mountain View, California (US). Over the last two decades Harald has developed a unique and proprietary set of tools and technologies to empower decision makers in the areas of Public Affairs, Key Account Management, Stakeholder Relations, HR and Organizational Development to navigate through the increasing complexities and unpredictability of our connected world. In hundreds of international engagements Harald’s visionary understanding of networks has helped Fortune 500 clients (HP, Xerox, Kodak, Allianz, Pfizer, Abbott , UPS etc.) as well as leading Non-Profits (Packard Foundation, Rockefeller Foundation, GIZ etc.) to reach their goals. Harald and his international team understand the patterns of interrelations and influence and turns market and organizational data into network maps and maps into strategy. 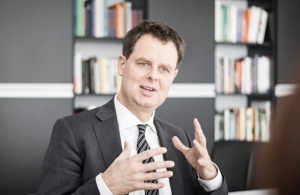 Harald holds a degree in Social Science and Philosophy (University of Vienna), is lecturer, visiting scholar, and regular invited speaker at various universities (Stanford University, Carnegie Mellon University, Vienna University of Economics and Business Administration etc.). His main academic research focus is the area of network theory and resilience research. In addition Harald Katzmair is columnists for the weekly magazine NEWS, he was elected as president of the association of foundations for the common good (Verband für gemeinnützige Stiftungen), and supports as vice-president the foundation NEIN ZU KRANK UND ARM in its endeavor to overcome illness and poverty in Austria.